Earwigs are spread primarily by transportation of products. Thus, items purchased at yard sales should be checked (e.g. cardboard boxes in damp outside areas). It is possible that most areas around homes are likely to be infested with earwigs. While it is unlikely that they can ever be completely eliminated, you can keep populations at acceptable levels. Earwigs are reddish brown and up to 3/4 inch long when fully grown. 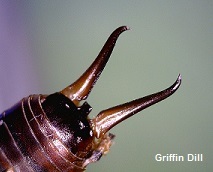 Earwigs have a pair of forcep-like pincers extending from the back end. The pincers are used for defense and also to catch the insects on which earwigs sometimes feed. 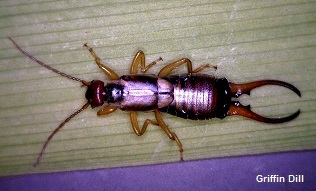 Young earwigs resemble adults but are smaller. The female mothers her eggs and young until they are big enough to wander away from the nest and obtain their own food. Usually, earwigs are first noticed in the spring around the outside of the home near the foundation. A certain percentage of adults and eggs last through the winter. Earwigs feed on flowers, other ornamentals and vegetables. Feeding damage appears as foliar holes and lacework due to their chewing mouthparts. Corn silk is a favorite food which is often consumed as it grows. This prevents pollination and causes poorly developed ears with many kernels missing on the cobs. As populations increase and spread, the areas in which they hide become more unusual. For example, they may be found on a roof under shingles, under siding, or under items hanging on walls as well as the usual hiding places mentioned above. Because earwigs also feed on decomposing organic matter, compost and mulch may provide food and shelter. Earwigs are nocturnal, actively feeding during the night and hiding during the day. As morning approaches, they search for a place to hide, preferably a dark, damp area underneath rubbish, boards, wood piles, near plants, rock borders or even in a home. Generally, they do not actively infest homes, but as they go up the foundations, any open area around the sill, door or window that will allow them to enter becomes an invitation to move in. They are not known to cause any damage to homes or their contents, but they are a nuisance, especially when they turn up in unusual places. A. Sanitation is most important. Avoid providing earwigs with ideal nesting and hiding places, that is any place an earwig could hide in, under or between. Removing these hiding places is a continuous job, but the most important time to start is spring when plants are not yet sprouted and most outdoor items can be moved. Any items left outdoors overnight; for example: laundry, lawn furniture, flowers, or vegetables– should be checked for earwigs before they are brought into the home. B. Traps can be made from two pieces of grooved wood placed together; these can be leaned against a tree or the foundation. Also 18 inch lengths of old garden hose cut at a slant to allow greater exposure of the opening, can be laid in the area where earwigs are present. Places traps in earwig area at dusk and empty traps the following morning. Placing boards or other items on the ground, giving the insects a hiding place, also makes an effective trap. A rolled up, moistened newspaper also functions as a good trap. Shaking the earwigs out of the traps or placing hose sections into a pail with a small amount of hot soapy water ends the pests’ travels. C. Bifenthrin, permethrin, and resmethrin can be used to control earwigs outside by spreading (according to label directions) the insecticide in a 10-foot band around the home. Include the foundation area, especially by basement doors and windows, where the sill of the house rests on the foundation, and where the siding starts. Sprinkle enough water on the sprayed ground to wash the insecticide off the plants and onto the soil (but not into the soil), where the earwigs will have the greatest exposure to the insecticide. Boric acid, bifenthrin, permethrin, resmethrin, or tetramethrin may be used to control earwigs inside the home. Use only household formulations of insecticides and only for cracks and crevices. If earwigs are controlled outside, it is quite unlikely that inside control will be necessary, other than using a fly swatter, rolled newspaper, or vacuum cleaner to kill or clean up strays.